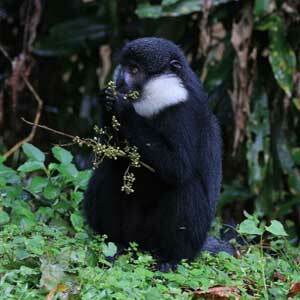 This tour brings you 3 days Chimpanzee tracking safari and other primates in the forest of Kibale National park. 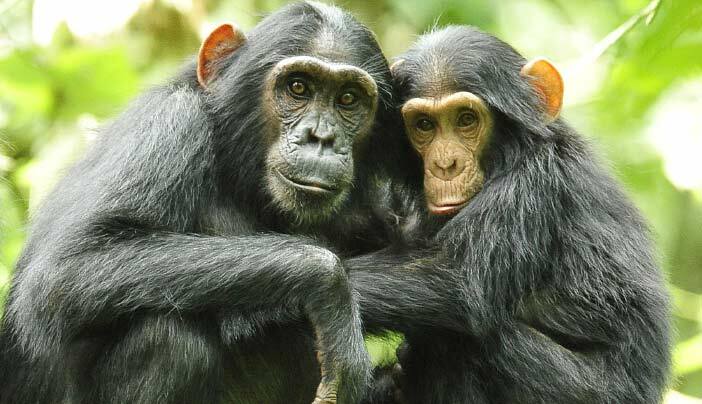 Kibale forest national park is also called the home of Chimpanzees in Africa. 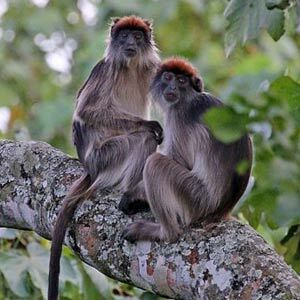 The forest is a home to other primates species(12) such as; Coppery-tailed money, Blue monkey, Vervet monkey, Black and White colobus monkey, Red tailed monkey, Red Colobus monkey, Olive Baboon, Thick-tailed bushbaby, Lesser Galago, to mention but a few. It also has Forest elephants and other mammals which can be seen on a lucky day. 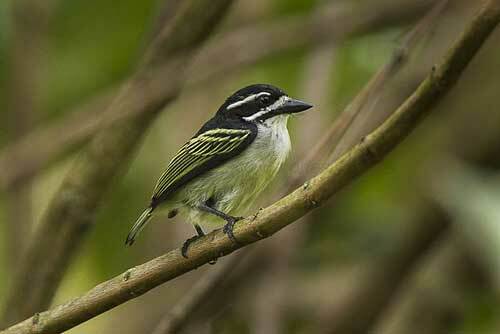 For birding enthusiast, this is one of the best Birdwatching Safari there is in the world. Kibale forests is blessed with multitude of bird species (over 370) including great blue turaco, Black and White casqued hornbill, White browed coucal, Ross’s turaco, etc that you can’t find anywhere else. With a good scenic landscape, large Tea and Banana plantations, beautiful explosion crater lakes and top of the world view makes the tour spectacular and adventurous. You meet our driver guide in the morning at your hotel/residence and start on an average 5 hour journey to Kibale forest National Park passing through major towns of Mityana, Mubende and Kyenjojo before being welcomed to Fort portal by green cover of large Tea plantations, the sight of women and men picking tea presents a good photography opportunity. Here 4 primate species are available at this sanctuary and over (280 bird species) including; the Great blue Turaco, Black and White casqued Hornbill, White browed Coucal, Ross’s Turaco, Grew backed Fiscal, African paradise Flycatcher, to mention but a few, a paradise for Bird watchers. After the walk we return to the lodge for dinner. After an early breakfast, you drive to Kanyanchu briefing centre for registration. After the briefing and grouping, we get a ranger guide who will lead a group of a maximum of 6 people into the forest for Chimpanzee tracking. The length of this trek depends on the availability of fruits and food for the Chimps, however an average of 4 hours is spent tracking these primates. Along the trek, Forest elephants and other mammals may be seen on a lucky day. Also and several bird species are seen in the forest trees. Some of the birds include; The crowned eagle, Green breasted pitta, Yellow-rumped tinkerbird. On tracking and finding the Chimpanzees, we spend an (hour) with our close cousins. Here you can take photographs of the Chimps and enjoy the your time with them. After the hour, we head out of the Uganda Chimp sanctuary for lunch, and have a restful evening. With options of a village walk or a crater lake exploration walk. Early in the morning, breakfast is served and then transfer back to Kampala or Entebbe depending on your interest/flight time. Our guide will be able to advise appropriately. Note: The cost of the Chimpanzee tracking Permit is $150 for foreign non-residents, $100 for foreign residents and 100,000 for East Africans (spending 1 hour with the Chimps). However You can have a Chimpanzee habituation Experience which lasts the whole day. According to Uganda Wildlife Authority latest tariffs, The adventure costs $220 for foreign non-residents, $150 for foreign residents and $70 for East Africans. 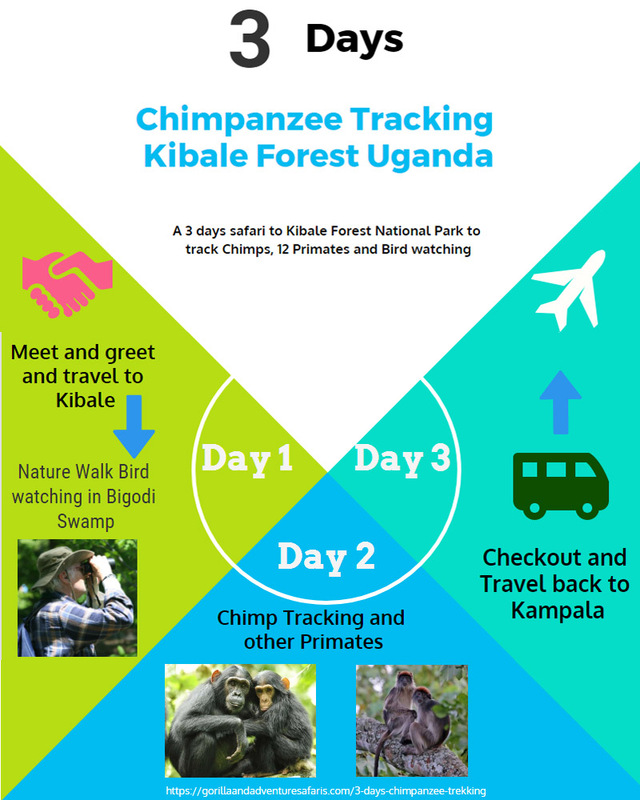 This 5 day Gorilla and Chimpanzee trekking Safari tour gives you an exclusive encounter with Uganda's Primates in Bwindi forest and Kibale National parks.